Cross-posted at The Educators' Cafe. ...freely accessible, openly formatted and openly licensed documents and media that are useful for teaching, learning, education, assessment and research purposes. OER are defined as teaching, learning, and research resources that reside in the public domain or have been released under an intellectual property license that permits their free use and re-purposing by others. I dedicate this dissertation to all of the innovative, inspiring educators who have enriched not only my learning but the learning of others by unselfishly spending hours of their own time using social media to connect, share, collaborate, and search for ways to improve their practice and in turn increase the learning and engagement of their students. When asked why they used social media for informal professional learning, my research revealed that educators valued the community, sharing, and collaboration made possible by its use. In other words, they valued the welcoming, open attitude they experienced online. I highly recommend you take some time and explore the wonderful collection of True Stories of Openness on your own. I wanted to share a few that particularly caught my interest because I have been following these particular people for a long time by reading, watching, listening to, being entertained/challenged, and learning from their work. Wes Fryer - Open Sharing Leads to eBook Inspiration: Indonesia to Minnesota to Oklahoma - Digital BackPack Project. "When you share openly and when you share publicly and utilize the social media channels like Twitter and blogs and other things like that, it really can be amazing and exciting to see what happens." Howard Rheingold - Sharing Pays Back - "I am a communicator, well, why not? ... for every ounce of my time that I share with others, I often find I get a pound back." Amy Burvall - Nichetastic! - There's a Niche for Everything - "Weird and endearing things that have happened since posting some educational parody videos to a budding YouTube channel; History for Music Lovers. It never ceases to amaze me that if you post it, they will come ... every niche, subculture, special interest out there. Just do what you love and someone will invariably love it, too." "Create. Don't hate." "Do it because you love it." "I feel not so much alone." Darren Kuropatwa - Connecting with co-workers. Darren shares pics via Flickr and videos. He said after reflecting, the most important part of his sharing has to do with people and relationships. Darren creates 'while walking videos' that he shares and people have started watching. His coworkers feel closer to him so that when they see him during the day, there is a connection. Darren shared a quote by David Wiley, "There is no teaching if there is no sharing." In response, he beautifully reflected, "That's what I do. I teach, therefore, I just can't imagine doing this any other way." Isn't that why we all became educators? To teach, to continually learn, try to be the best educators we could for our students? During the various chats, discussions, and posts the roadblocks to openness were discussed. Topics such as intellectual property rights, fear of theft, copyright/copyleft, and attribution came up, and they are terribly important. It's our job as educators to teach the importance of giving credit and to model doing so. In the years to come, these issues will evolve, but we shouldn't wait for a resolution. We should continue to share openly with each other. That's what we do. We teach. We share. 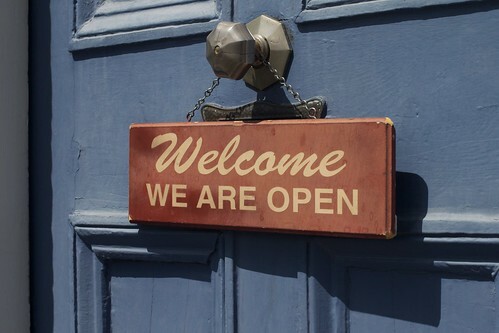 We are open. We can't imagine being any other way.